In-depth study of the Synoptic Gospels’ Sabbath controversies revealing the halachah of Yeshua. A Torah perspective on environmentalism and stewardship over creation. An important new book charts our modern Messianic Jewish theology. Get to Know Yeshua Better! 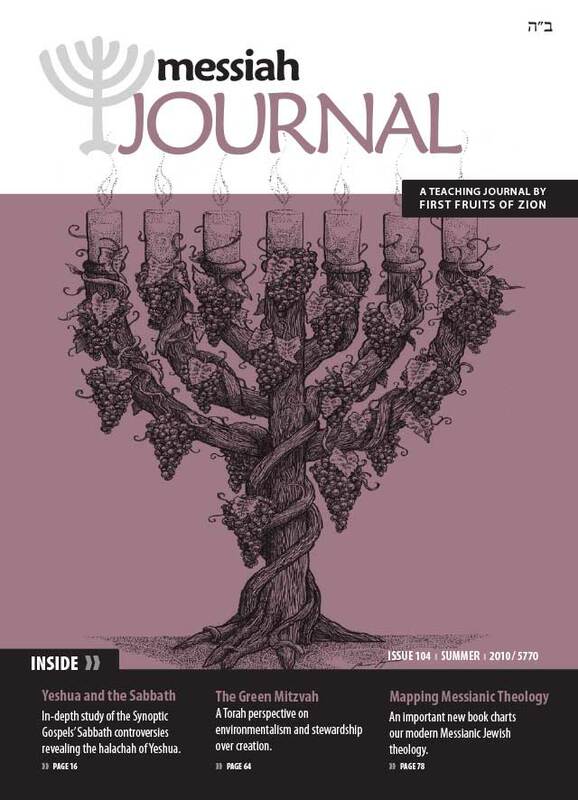 This is the title of this issue's letter from Boaz, covering various topics and upcoming resources at First Fruits of Zion. a) The new Torah Club, Chronicles of the Messiah, b) The Delitzsch Hebrew Gospels, c) The status of the Siddur Project. An in-depth investigation into the Synoptic Sabbath Conflicts. When Yeshua healed the people in the synagogue or at the Sabbath table, was he breaking the Sabbath? Did Yeshua's disciples break the Sabbath in the grain fields? The Master justified healing on the Sabbath and did not rebuke his disciples for picking grain. Find out why and learn about Yeshua's Sabbath halachah. In the beginning of creation Shabbat was instituted as a universal principle for all mankind. Later it became an explicit commandment and sign between God and the Jewish people. Taking into account these two facts, how then does the Gentile relate to Shabbat? Living as a Messianic Jew in Israel is not without its challenges. Ministering as a Messianic Jew in Israel is not without supernatural challenges. Read this personal account from believers in the Land. A translation from the Hebrew, Yalkut Shimoni Isaiah 499, an anthology of aggadic midrash. Read this messianic passage that has engaged the mind of Jewish interpreters throughout the centuries. Evaluate the extent to which faith in Yeshua coincides with or deviates from what is considered normative in Judaism today. Daniel Hennessy is a Holocaust educator trained by staff from the Yad Vashem International School of Holocaust Studies in Jerusalem, Israel. In this article he reminds us about the sin of being a bystander when it comes to taking action in remembering the Holocaust. How do we, as believers in a Jewish Messiah, deal with Christian complicity and silence during the Holocaust? C.S. Lewis predicted the increase of science and technology in the next generation, but he also saw that it had the potential to have a negative impact on the earth and its resources. In the beginning God gave man authority over the earth, to nurture and protect it. In our day we face some tough challenges in this regard. Learn what the Torah has to say. In this short article we discuss the recent announcement by Israeli archaeologist Dr. Eilat Mazar of the discovery of a Solomonic Jerusalem Wall, dating to 10th Century B.C.E.